Affordable Accoutrements: Hundred Dollar Table Challenge! It's time for another Tablescape Thursday with Susan of Between Naps on the Porch! Check out all the wonderful tablescapes HERE! I thought it might be fun to set a table for six, limiting myself to items that cost a total of around $100. That total would include china, crystal, flatware, table linens, fresh flowers, candles, and candle holders. The courses to be served would include soup, salad, main course, and dessert. Stemware would be for wine and water (or iced tea, the "house wine" of the South). The plan was not to actually go out shopping for new items. I decided to use mostly things I'd purchased previously, but hadn't yet used for a table post. I'm fairly certain only the placemats, water glasses, and chargers are being repeated. I arranged the flowers and set the table the night before. The first photograph below was taken mid-morning. The cream soup bowls with underplates are vintage Theodore Haviland (made in America). I found a set of eight on eBay. The minimum bid was $10. I bid the $10, and there were no other takers. Since I'm using only six of them today, I'll list the cost at $7.50. I often buy vintage table linens at estate sales. Usually the damask napkins are luncheon size, but these are the larger ones. They'd been starched and ironed with nice crisp folds. The best part is that a set of six had been reduced to only $3 on the second day of the sale. I mixed and matched vintage silverplated flatware. The dinner forks, knives, teaspoons, and soup/place spoons are all the same pattern. I added iced tea spoons, salad forks, and butter spreaders in other patterns. The service for six came from an estate sale. It was stored in a wonderful old leatherette case. The silverware itself was blackened with tarnish, but appeared unused (I didn't find a scratch on it anywhere). I polished it gently, leaving some of the tarnish here and there to highlight details of the design. Most of the odd pieces were dug from $1 boxes at local antique malls. They have a softer look, a patina of tiny, fine scratches from years of use and frequent polishing. It often gives old silver a look similar to that of pewter. A closer view of the dinner and salad forks. You can see the clear salad plate here, between the soup bowl's underplate and the dinner plate. It has a stylized, etched laurel design. I frequently purchase clear glass plates at estate sales and thrift stores. I pay less attention to the design than to the clarity of the glass and their overall condition. They're great for buffets and parties, (so much nicer than using plastic I think) and, when they're purchased inexpensively, I don't hesitate to put them in the dishwasher. A few months ago, I was a guest at a dinner party where the hostess served crème de menthe parfaits. I hadn't thought of that particular dessert in years, but I used to love ordering it in a favorite restaurant. They were so pretty, and so refreshing at the end of a meal. Since then I've kept an eye out for vintage parfait glasses. I found these at Goodwill for only forty-nine cents apiece. The underplates were also from GW. A stack of 8 was bundled together and priced at only $2.99. They were probably intended for use with matching cups, but I thought they worked well with the parfait glasses. Iced tea spoons are "parfait" for getting every little bit of goodness all the way to the very bottom of the glass. I found a dozen or so of these tall crystal candleholders at Goodwill one day. They were only ninety-nine cents each, but the red price stickers were the featured color that week, so they cost half that. Most still had their original manufacturer's stickers as well, made by International Silver Company. A better view of the candleholders. The candles came from Walgreen's after-Christmas sale. They were regularly 2 for $1 ... but they were 80% off! Don't you love free flowers? I took a walk through the garden with secateurs in hand. I learned the word, secateurs, from Coty of Styling by Coty Farquhar and Styling Gardens by Coty Farquhar. Sounds so much nicer than plain ol' garden shears, doesn't it? I returned with redbud, dogwood, forsythia, cherry blossoms, daffodils, yellow rose of Texas, hellebores, fern fronds, a white hyacinth for fragrance, and a tulip or two for an extra touch of color. There are also some small white flowers in the arrangement that remind me of lily of the valley, except that they're taller and the foliage is similar to daffodils'. Perhaps some of you can help me identify it. The placemats came from Dollar Tree. The gold-rimmed plates with the pink and yellow roses are by Homer Laughlin. I bought six dinner plates, six bread plates, a platter, and assorted other pieces for $2 at a local charity thrift shop. The lady who runs the shop said a woman had donated them earlier that day. She said she'd set up housekeeping with them in the 1940s, and now it was time for someone else to enjoy them. A closer view of the dogwood and hellebores. I tried it first without the silverplated chargers, but the extra layer seemed necessary somehow. I like the way the mirror-like shine reflects the flowers and other colors surrounding them. The taller glasses came from Goodwill, regularly ninety-nine cents each (but purchased for 50% off). I've used the Fostoria Puritan water glasses on previous tables. I found eight of them, some with original Fostoria stickers attached, at an indoor flea market. The set was priced at $20, with an extra 20% off. Puritan is a clean-lined, mid-century design that mixes well with almost any type of stemware and china. The garden's really taking on the look of spring quickly now. Isn't it a wonderful time of year? The soup bowls and dinner plates have in common gold rims and pink roses. Obviously they're far from being a perfect match, but I find that interesting. What about you? Do you like mixing patterns within a place setting? Time for a disclaimer. I would NEVER use such a large centerpiece for an actual dinner party. This is for fun ... and for drama. But it's too high, too wide, and the container is inappropriate. This arrangement would work well in an entry hall or on a sideboard. If this table were intended for a meal with friends, I'd also remove at least half the candles, particularly the ones between the place settings and near the corners of the table. On second thought, if the guests disliked one another intensely .... ;) Never mind, who would want to host (or attend) a dinner party under those circumstances? View from above. Usually I line up the flatware approximately 1-1.5 inches from the edge of the table. Since this table has curved edges and the placemats have angled corners, I arranged the flatware more informally. Which do you prefer: handles lined up like little soldiers or arranged in a graceful curve? Below, two views from the kitchen pass through window. I purchased the candleholder on the right (a pair actually) at an "upscale resale" shop for $2 the day the table was set. I couldn't resist adding them (along with $2 toward going over budget for this challenge!). I could hardly wait to light the candles and see if I liked the overall look. Sometime, if you're really bored, try keeping this many candles straight while you're taking photographs! I NEED some candle "stick em," but it's not in the budget for today! I like the way all the flickering flames are reflected in the china and glassware. I'm ready for my parfait now! There's still time for an early evening stroll through the garden. OK, I went over budget, but not by much. I could have left off the chargers and the new candleholders ... or the salt an pepper shakers. But why? My primary goal was to set an attractive table for you today. I hope I accomplished that. I like the fact that this "challenge" table includes names like Theodore Haviland, Homer Laughlin, Fostoria, and International Silver. It demonstrates that good quality vintage tabletop items can be acquired without spending a great deal of money. If I can do it, YOU can do it! 1. Decide what you like, and learn all you can about it. Research manufacturers and patterns online and in books. You don't even have to buy the books. Most libraries have reference books on vintage/antique china, crystal, and silver. 2. Shop often to get the best prices (and not necessarily when you're looking for something in particular). 4. Be friendly when you visit thrift stores and resale shops. It costs nothing to be pleasant. Staff members tend to remember the really nice customers and the really NOT nice ones. It goes without saying which of those customers will be provided with the friendliest service, the best advice, and the best prices on negotiable items. 5. Be creative; ignore the rules; have fun; mix old and new, elegant and simple, heirlooms and thrifted items. USE the good stuff. Otherwise, why have it? Celebrate life, love, and friendship ... as often as possible! Gorgeous, gorgeous, gorgeous! I LOVE mix and match- that's the way I do many teas and lunches. I would give you an ovation for this challenge! As always a spectacular table!! I LOVE the view of the garden and your table looks great midday, afternoon and evening! Thanks for such a clever post, I love the idea of the budget. What a wonderful idea you had! I love the sparkle from all the different glassware and candleholders, and you mix china patterns beautifully here! Those soup bowls were a FIND! Wow! So many candles! Kudos to you for keeping them straight w/out sticky! LOL! I especially love your floral arrangement and how it compliments your beautiful outdoor view! Just gorgeous, all of it! What a neat challenge, Bill, and a lesson learned!! Your table is gorgeous as always and I totally enjoy the view outside your windows which is only rivaled by your gorgeous centerpiece! Thanks for all the tips. So glad I stopped by! First of all, let me just say that you have got skills! Photography skills, tablescaping skills, blogging skills, you get the picture. I'm in awe. Beautiful! I love the flower arrangement even if you think it's too big, too wide and not in the right size container ;) I say leave it on the table! Mixing patterns and be full creative, why not, love it!!! Another masterpiece - but I have to admit the beautiful Spring centerpiece bouquet really stands out. I have been out and about most of the day, sneezing, itching & watery eyes, but loving it all. I may be hauling pots of annuals inside Thurs. & Fri. nights - blackberry Winter?!?! Just exquisite. I am learning to mix and match after a Southern upbringing where everything had to match...thanks to you and other bloggers. I really like the combinations you chose. And what a great idea to challenge yourself that way. Your tips are much appreciated. Thanks so much for your postings. Hey Bill, I used my good china and crystal and tried to be just like you last week..even a living centerpiece and you didn't even show up!.. I'll leave the light on for you! And I excuse you from looking at tomorrow's..it is nothing special! A very pretty table, as always. And yes, that definitely is NOT a centerpiece for a dinner party. We always do the centerpiece and then sit down opposite one another to make sure that it isn't too big!!!! But it's a great centerpiece for "play"!!!! Bill, You have put together one good looking table! Fantastic buys. Yet another gorgeous tablescape Bill, and your yard and floral arrangement are both breathtaking! What a lovely tablescape, Bill. Hard to believe it is all for barely over $100. I'm especially pleased to see you using gold-rimmed plates with silver chargers. I don't usually see that, but I love the look. I have platinum banded stemware and have always worried about using it with gold pieces, but don't think I'll worry any longer! Fabulous, and exactly my type of shopping. I found a WM Rogers silver tray today at GW for $1.01. I also picked up a Shannon crystal candlestick for $2. I love GW! This again is a beautiful table. I like this composition of mix matching dishes. The many glasses, the soft pastel pattern on the tableware and fresh flowers look light and airy and very springlike. It pays to buy good things, especially when you get it cheap. Quality product simply look better. And after all, your photos are amazing. Thanks for sharing. I first thought what a lot of glasses, especially as I don't drink wine etc.. but later when the candles were lit, the table and the ambience changed and I love it!! Being a Brit I couldn't quite work out the costs but I guess they were all bargains but they look a million dollars ( £ pounds)! You have such a lovely house and garden, I would eat a sandwich and have a cup of tea and be happy there. Thank you for the time you spend and sharing your hints and tips. Bill, What a fabulous post! Your table is exquisite as usual, and challenging yourself to $100.00 for the whole things was a very good lesson for us. I love your use of old vintage china and glassware. You have a way of putting it all together in the most spectacular manner! I am just drooling over your silver chargers. I am on the look-out for these too. Your centerpiece is a masterful study of Spring. It looks perfect with your dishes and candle color. Beautiful, beautiful, beautiful! I too always worried about a centerpiece that was too tall for guests to see over or around. But I do love a large statement in the center of a table. Our dear host Susan told me, when I fretted about a large centerpiece, that it is perfectly fine to have one on the table. Just remove it before guests eat- it can be replaced with a smaller centerpiece you would keep on hand. So I have put that rule into practice when I entertain. You could have a small silver bowl full of those luscous flowers from your garden ready and waiting, and put the tall arrangement on a side table. Thank you for the great advice about how to purchase beautiful items for our tables without spending a fortune. I will certainly put these into practice. And I love the advice to be kind. One of my soapbox issues is the need for people to be civil and kind. There is never a need to be rude, demanding or entitled. Thank you for that "golden rule" advice. I always come away from a visit to you so inspired! Hope your day is as beautiful as your table! What a gorgeous table Bill, done on the cheap! I love the mix of old and new, but I especially love your floral arrangement. It's just stunning! Have a great week! What another beautiful table, Bill. i am still on the hunt for stemware and studying as you have suggested. I am also looking for parfait glasses! Creme de Menthe parfait was always a favorite and a real treat as a child. This was a great idea Bill. The large photo of the floral arrangement is so gorgeous. All from your garden? Boy am I jealous of that. My hellebores are in bloom but not much else up here in the north. We are not allowed to cut dogwood in B.C. because it is our provincial flower. As for the dinner party with guests who don't like each other....I think I could have a lot of fun with that scenario. I am a little wicked though. Once again that floral arrangement is breathtakingly beautiful. Another "Tremendous Table" "By Bill." The floral arrangement is perfection. I see nothing "inappropriate" about the container. Just found your marvelous blog, so many beautiful tables I hardly know where to begin. I like how you end your posts with sparkling candlelight, my favorite decoration. I'll be following along and will be back soon for more wonderful ideas. Can I go to shopping with you? As always just beautiful. I especially love the centerpiece. Great colors. The view of the back is stunning too. As always, thanks for fulfilling my need for table eye candy. Just stunning as usual...great tablescape for a budget conscious tablescaper. I know you live in TN...anywhere close to Nashville. I so want to check out your Goodwill stores. Care to share the locations???? Thanks for another beautiful and informative posting! Another beautiful tablescape. You are my kind of shopper. This goes to show that you do not have to spend a lot of money to create fabulous! The flowers and urn are beautiful. The $100 tablescape is gorgeous & really breathtaking by candlelight. The centerpiece is spot on. My dinnerware is either hand-me-down (the best kind) or thifted so I really love how you mixed and matched everything. You really inspire me. Hi Bill, Another lovely tablescape! Thanks for showing the views of the garden through the windows. It is looking lovely. Your soup bowls are beautiful and go well with the dinner plates. The clear plates you show as salad plates - I think they may be the same ones I show as salad plates in my tablescape for this week - I got them when I was engaged over 30 yrs ago as a gift. The candleholders are amazing. I can lend you some candle stick'um! lol I believe the little flowers are snowdrops. I enjoy thrifting and thank you for the tips. At my favorite thrift store, the clerk tells about the Roseville vase that they sold for $1 and the customer told her he'd sold one just like it on Ebay for $600. Don't we all hope for something like that! Great post, Bill. Bill, what a wonderful tablescape and I echo your sentiments on use what you have, love and mix it all up! You certainly find great items at such affordable prices. I consider myself the yard sale queen but you have to be the yard sale king! I couldn't get these prices in the New York area! I certainaly enjoy all your posts. Keep them comin! Bill....as usual your tablescape is stunning and I can't believe the $100 challenge! All I can say is "I want to go shopping with you!" Hi Bill. Those flowers that are like big-scale lilies of the valley are Leucojum aestivum, also known as summer snowflake. They're in the same family as early-blooming snowdrops (Galanthus), whose flowers have the same 'cutwork' effect. There's an earlier-blooming, shorter Leucojum vernum, the spring snowflake, that blooms just after the snowdrops. You've changed my dinner table for the better! Your posts are responsible for my developing an interest in stemware, and 1930s elegant glass stemware in particular. So, especially given the theme of this week's table setting, I wanted to let you know that I happened on a big bargain in a local antique mall: four topaz Fostoria Trojan water goblets, in perfect condition, for $50 (50% off from the already pretty good price of $25 per because the booth is shutting down). They were the highlight of my Easter table and give me a lift whenever I look at them. The color echoes the gold trim that's on china without adding more flashiness; I much prefer that effect to actual gold rims on glasses. Thanks for the work that goes into the images of your lovely table settings, and the information that accompanies them. Great challenge! Your table is beautiful as always. I love that you mixed patterns and "quality" throughout the place settings. Thanks for sharing such a great table. Oh Bill...as always your tablescape leaves me wishing you were my neighbor, or brother, or uncle so I could see it all in person. Your works of art ALWAYS take me away from the present and I leave feeling so peaceful. LOVE your floral arrangement and the salt and pepper shakers. I really think you should join in with Susan and a few others to create a tabletop book of tablescapes. I have yet to find one that I would call my favorite (tabletop book) and I just know that if you put one out...I'd finally have a favorite. I love those candle holders, too!! What a fabulous GW find and they will GO WITH EVERYTHING!!! They're so long and elegant!!!!! I like the reflection on the chargers and cutlery in photo #2. Your tables are always my favorite of all. Hi Bill! Exquisite as always. I'm not sure you know, but I'm a Master Floral Designer. First your design is gorgeous. The flowers you were questioning that looked like Lily-of-the-Valley (Convalaria)is just that. Older plants can be that large and ones specially grown for the floral industry. They are endangered in the wild as are Saracena Lilies and are only allowed to be cut during certain times of the year in designated areas. You sure know how to make $100 look like a million...in other words, your table is beautiful! Bill, I love your beautiful $100 tablescape! You did a wonderful job of combining the vintage items. To answer your question: I normally line my flatware up like little soldiers approximately 1 inch from the table edge, but I really liked the way you angled yours. It somehow seemed right with the angled placemats. Visually pleasing. I loved the sparkle of this table. Great job! Thanks for sharing. Only you, with your magic touch could come up with this! I enjoyed seeing the gorgeous photography! I LOVED seeing the dogwood, I haven't seen it for real in many years! Well done, no exquisitely done. Your table is wonderful and how fun to stay within your budget (almost) Your photos are fantastic and I always look forward to the shots looking out your clean shiney windows. Very homey, welcoming and elegant. This is beautiful Bill -- as usual. You took a hundred dollar table and gave it a million dollar look! Spectacular! Hi Bill, your table is magnificent...I love all the candles....and you cracked me up with the Dollar Tree placemats...I love that store and I have bought some of their placemats! I always drool when I visit you weekly and I really do love every settings you performed. How I wish that we have a $ store in Stockholm. Yes, I visited that store when I was in the US and purchased cool stuffs. You are one lucky guy with all those gorgeous collection. Have a great w/end ahead. I hope that you enjoyed your conference. As usual your tablecsape is most outstanding and very inspirational! You are a tue master of the mix, and yes, selecting fresh flowers from your gareden is a wonderful experience and they look sublime! Your suggestions, tips and pointers were very informative and I shall take them to heart and follow your excellant advice! Our garden is just beginning to burst forth and we are so looking forward to having been selected from our smallish city of 450 thousand to be a part of a six garden, garden tour as a funraiser on June 17th! My husband and I both adore gardening! P.S.~ My dearly departed dad with whom I was very close, used to also refer to me as 'W.L. ', as you did on one occasion Bill;(he and I would also happily polish silver, by the hour in preparation for my tea parties).~ Referring to me as, 'W.L. ', brought back many pleasant memories). Bill, it is amazing that such a stunning table can be set for $100 , especially with a list of famous names such as you used. Beautiful as always, and such fun to see where you'll set a table each week. Love the centerpiece! Thanks for sharing week after week! This is a favorite stop for me! So pretty Bill! Truly, it is. I always love seeing your china of the week. :) Fun challenge you presented us this week and I am quite sure mine tablescape this time is well below $100. I found my china at the thrift shop for $1 a plate!! :) My candlesticks were a church action find...I think they were around $4 a piece. The egg holders were a thrift find, as well as candles. My place mats were probably the most pricey. I always admire your attention to detail with everything. Gorgeous! Fun idea. I knew you wouldn't disappoint me I adore your shots after dark with the soft glow of candlelight. Beautiful! Very nice post, as always, and Goodwill clearly isn't as picked over where you live as it is here. I am intrigued by your dining table which reminds me of Tommi Parzinger. Have you posted about that before? Hope you will stop by and see us (get in on our giveaway if you haven't already). -- Jane F.
I look forward every week to your posts. Just lovely, perfect, neat, interesting, and I love love love the flowers! Bill, I so enjoy your tablescapes, descriptions, creative eye, and your talent for a finding a great bargain. Beautiful! Hi Bill, beautiful, beautiful, beautiful! As always. And what a great challenge. As I've mentioned before, too, I love how you take photos all through the day, into the candle light of the evening! It's so lovely, soothing, makes me feel as if I've spent the day, right there with you! There's no one else in the whole of the world that could do THIS with a hundred dollars. Good grief, Bill..you have so much talent at this. And, your love for it sure shines thru. I love your beautiful table. Just stunning! You have a magical way of NEVER making your tables seem crowded..many of us tend to *overdo, but you seem to know exactly when to stop. You take the required time to get all the photos at different times of the day and night and it so makes for beautiful photos. Bill...this was an amazing tablescape! It really turned out beautifully and no one would ever think you did it on a budget of around $100. You are so right...with some patience and thrifty shopping, you don't have to go broke to create a stunning table setting! Love all your suggestions...good advice to follow! Not only have you created a beautiful table for us, you gave us some wonderful advice to help us create our own tablescapes. Thank you, Bill, for your teachings and your inspirations. A very attractive table, indeed! I'm almost worried that if I took your advice on how to get all the fantastic deals that you find, that my house would become overrun with tableware! Your tablescape is so beautiful it's hard to find words . . .
Amazing ! What a relaxing evening the setting would provide. 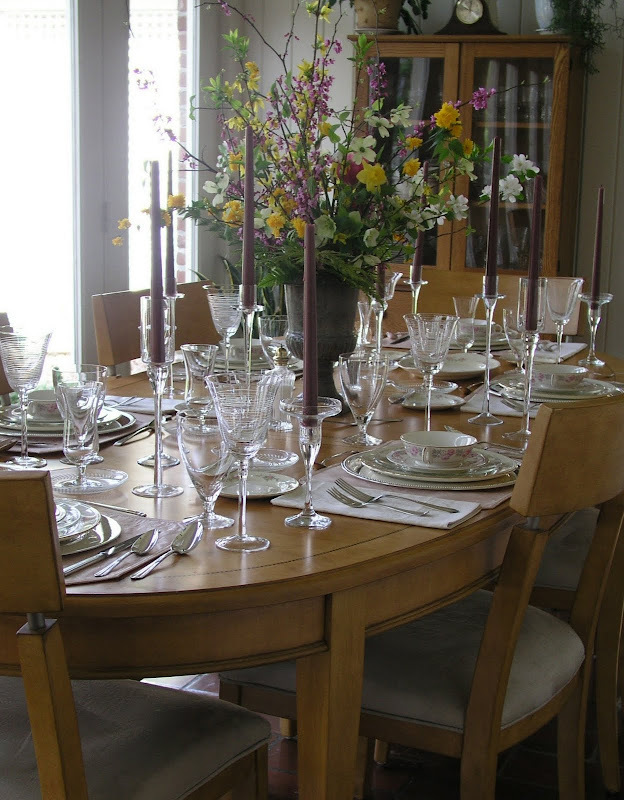 If I arrived at a home where the table was that beautiful I would feel like a truly treasured friend. Bill, you never cease to amaze me! This tablescape is stunning with the sun shining in on all that crystal. I love the $100 challenge too. Let's just say the estate sales in my area are not so negotiable. That arrangement though took my breath away. I couldn't stop staring at all the photos. To think you gathered those flowers from your garden. This belongs in a magazine! Aahhhh. Now my Sunday is complete. Absolutley beautiful. I'm late getting to see everyone's tables this week. Sweet Caroline was here & she commands my full attention! How incredibly ingenious of you to blend the pale pinkish-purples in those delicate dishes with the phenomenal flower arrangement & candles as well as the gorgeous lavender bushes outdoors! It all ties together so seamlessly. You truly are a master at this art form, Bill, & it IS art! DH ♥'s crème de menthe parfaits & it is his favorite Christmas dinner dessert. I don't serve it any other time, but I should. Well done, my friend, well done! Bill, I now know what the little flower is - earlier I guessed "snowdrops" - and I was wrong. They are Leucojum aestivum (Summer Snowflake). I have this on good authority - I saw the photo in the Breck's bulb catalog, where I read the description including "snowy white flowers, each of which features a distinctive green highlight on the tip of each petal." Great tablescape as always and thanks for the mystery. You had this gardener puzzled - I learned something! Another stunning tablescape from you. You have such class and elegance and it is always so refreshing to hear you describe your tables which are set with love and attention to detail. I am impressed with the bargains you find. One would not be able to get those goodwill prices here at home. I check in often and the prices here can be quite high, especially for vintage. I think that is absolutely stunning! The floral arrangement is one of the most beautiful I have ever seen EVERE. Hello, again! I'm still sitting up reading back through your blog! It will be hard to get up tomorrow and I need to set my table for guests tomorrow night! You didn't mention the pattern of the Homer Laughlin dishes you used in this setting. Just in case you don't already know, I wanted to tell you that it is Countess. The reason that I know is that I recently saw some on another blog (I actually think it was Susan's BNOTP -- and the pattern was on a different plate shape). I was so taken with it that I started looking for some myself. As everyone agrees, this is an amazingly beautiful tablescape. And, I'm enjoying your blog so very much! Late to this party but I think your extra white flower may be a snowdrop. If it is,it is a bulb. One of the first flowers of the spring. Lovely table!